Carte de l'Egypte Ancienne et Moderne Dressée sur Celle du R. Sicard et autres assujetties aux observations astronomiques. Remondini [Map of ancient and modern Egypt]. Large antique 18th century atlas map, printed on thick, good quality paper with original outline hand colour/color and decorative title cartouche, 1784. Title of map:'Carte de l'Egypte Ancienne et Moderne Dressée sur Celle du R. The image below shows an enlarged cross section from the centre of the map to show the level of printed detail. This map is folding hence the centrefold line may show on the image below. 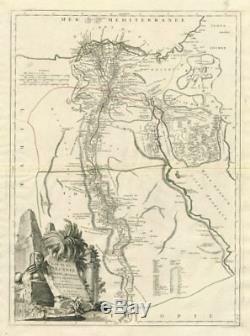 A decorative 18th century map of Egypt, showing ancient and contemporary place names along the Nile valley, and geographical features in the Sinai. IMAGE SIZE: Approx 67.5 x 50.0cm, 26.5 x 19.75 inches (Large); Please note that this is a folding map. ARTIST/CARTOGRAPHER/ENGRAVER: Santini, Paolo and Robert de Vaugondy, Gilles & Didier. PROVENANCE: "Atlas Universel, dressé sur les meilleures cartes modernes", 1784 à Venise par P. Santini, rue Ste Justine, chez M.
TYPE: Large antique 18th century atlas map, printed on thick, good quality paper with original outline hand colour/color and decorative title cartouche. VERSO: There is nothing printed on the reverse side, which is plain. CONDITION: Good; suitable for framing. However, please note: Blemish in margin. Virtually all antiquarian maps and prints are subject to some normal aging due to use and time which is not obtrusive unless otherwise stated. AUTHENTICITY: This is an authentic historic print, published at the date stated above. I do not offer reproductions. It is not a modern copy. The term'original' when applied to a print means that it was printed at the first or original date of publication; it does not imply that the item is unique. Print' means any image created by applying an inked block to paper or card under pressure by any method including wood engraving, steel engraving, copperplate, wood cut and lithography. REMARKS: FRANCE: Gravures et Cartes anciennes. DEUTSCHLAND: Alte Lankarten und Stadt ansichten. ITALIA: Stampe e Mappe antiche. ESPAÑA: Mapas antiquos y impresiones antiguas. The item "Carte de l'Egypte Ancienne et Moderne. SANTINI / ROBERT DE VAUGONDY 1784 map" is in sale since Thursday, November 16, 2017. This item is in the category "Art\Art Prints". The seller is "richben1066" and is located in London. This item can be shipped worldwide.